VTA has been holding public meetings to review proposed changes to transit services, and there are quite a few items on the list that would impact San Jose residents. The two new lines that really caught my eye are Line 11 and Line 56. 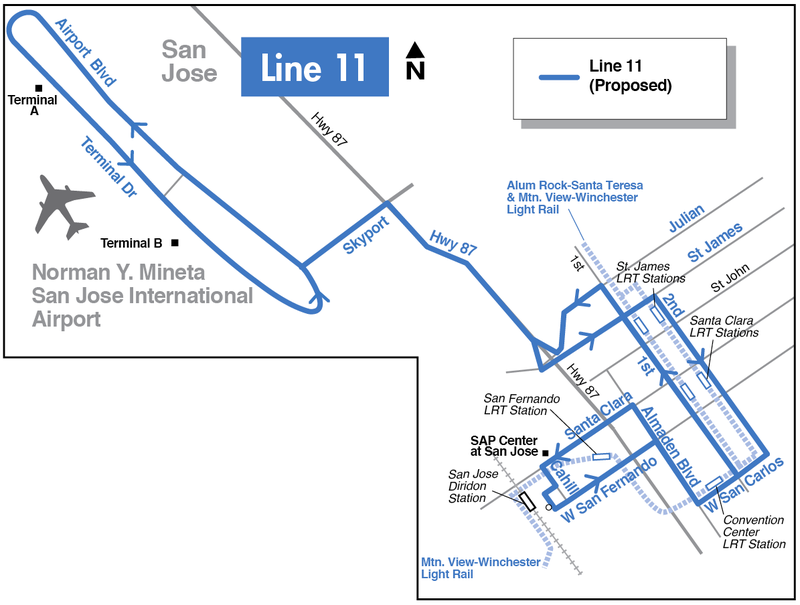 Line 11 would directly link the Airport with Downtown San Jose! It runs from Diridon Station, past the Convention Center, down 1st Street, then onto Highway 87 and does a full loop of SJC hitting both terminals (see the map below). Needless to say, Line 11 would be extremely convenient for Downtown residents and visitors alike. The line would run every 30 minutes from 5am to 11pm, seven days a week. Service will hopefully begin in October of this year. 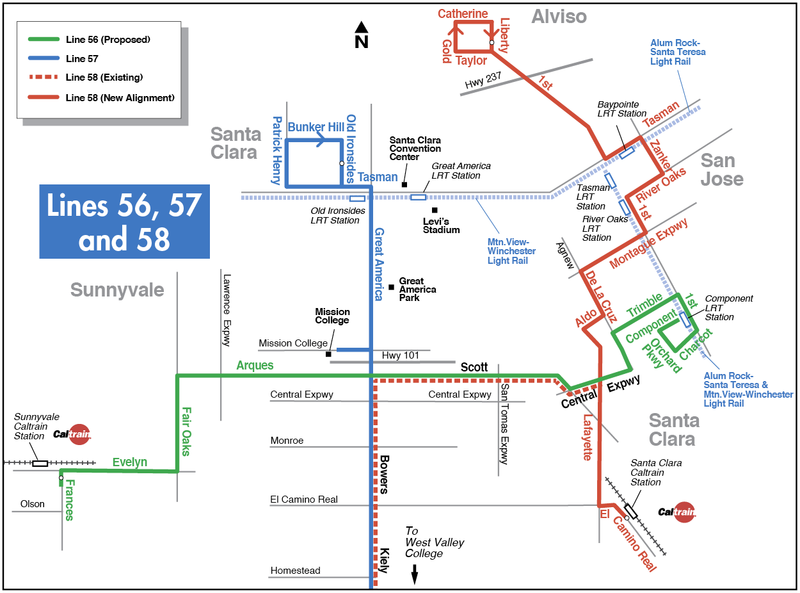 Line 56 runs between the Component Lightrail Station in North San Jose and the Sunnyvale Caltrain Station (via Arques/Scott/Central Expressway). This would improve access and transit options for all of the companies in the Golden Triangle, including the burgeoning Renovation Row area. For all of the details, head over to this VTA page. The new Line 11 is a great idea - but it will only be convenient if it runs at more frequent headways. I fear designing the line to run only every 30 minutes is setting it up for failure. Most potential riders flying into and out of SJC won't want plan their trips around that schedule, especially if there's a big risk in being set-back half an hour because they just missed their bus. 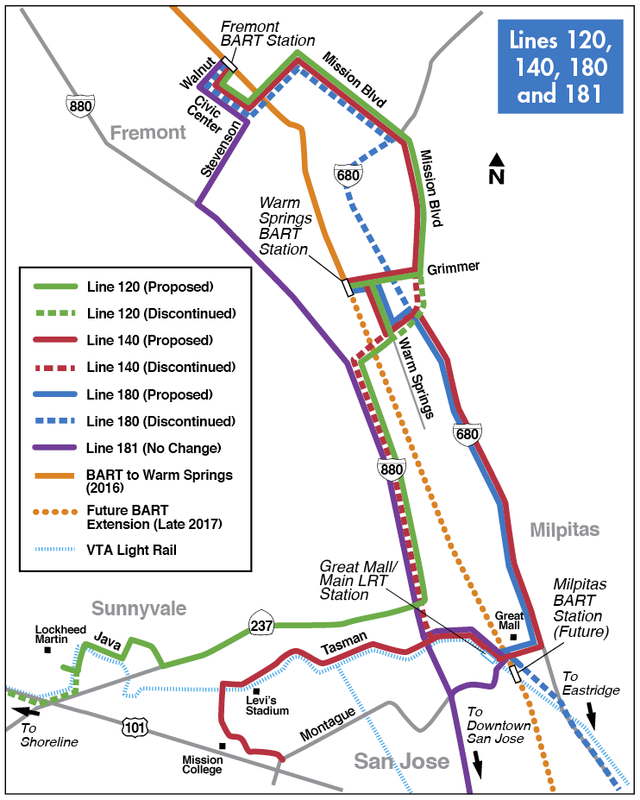 Will the VTA fare ticket line 180 from Great Mall to Warm Springs be lowered in the new proposed line? Since it will no longer travel up north to Fremont Bart Station. Why will they still run line 181 to Fremont BART when the Warm Springs station will be open by then?